I love these oatmeal cookies because they're a real sleeper. They taste decadent, with warm chocolately goodness, but they are actually a not-bad-for-you snack, sporting only about 80 calories per cookie and a seriously reduced amount of butter, plus oats, flax seeds and wheat germ. Let's not go crazy and call them a breakfast cookie, but they're a sensible choice when you want a sweet snack. 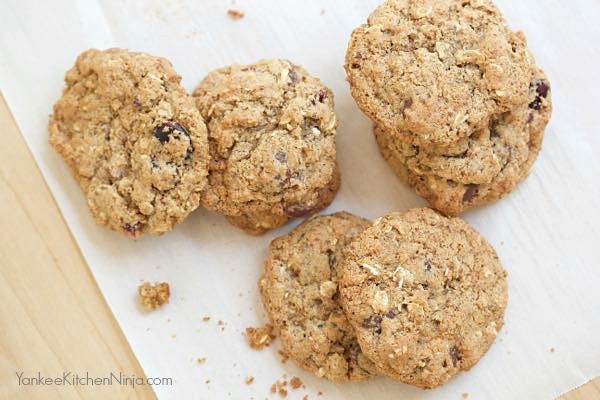 I've been making these healthier oatmeal cookies for over five years now and they never fail to wow the crowd. Plus, they travel well, making them ideal for sending in care packages to kids at camp or in college. Or consider including them in your annual holiday cookie swap this year. If you're some kind of oatmeal cookie purist, I suppose you could omit the chocolate chips. Wait. On second thought, no. 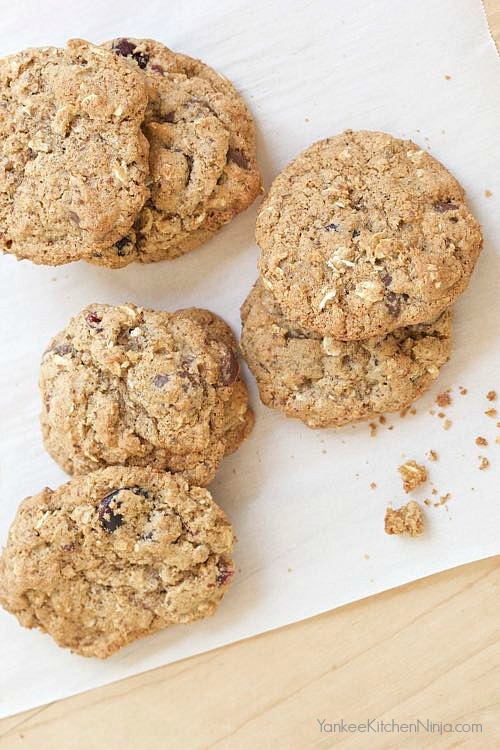 If you're some kind of oatmeal cookie purist, just make a batch of my salted oatmeal cookies instead and leave the healthy stuff for the rest of us. 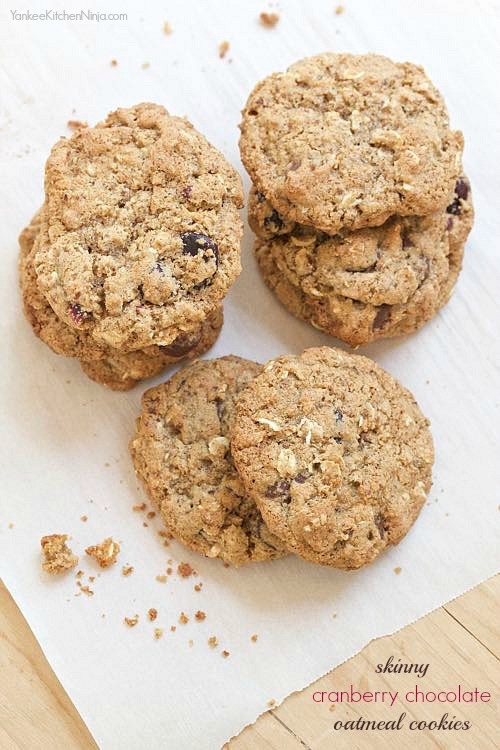 Do you prefer your oatmeal cookies chewy, crunchy or a little bit of both, as these beauties are? Leave a comment: The Ninj wants to know. With a stand or hand mixer, beat together the butter, both sugars, cinnamon, baking soda and salt until well combined. Next, beat in the egg and vanilla, then add the flour and mix until combined. On slow speed, fold in the remaining ingredients. Drop the dough by approximately tablespoon amounts onto parchment-lined cookie sheets (give them about 2 inches in between, as they spread). Bake for about 10 minutes or until the tops are lightly browned. Let the cookies cool on the sheet for 1 minute, then move them to a wire rack to cool completely. Yield: approximately 2 dozen cookies. These sound great! Mr. Achmed loves a nice crispy oatmeal cookie, but I rarely make them since the recipe I have is loaded with fat. I'll have to see if I can slip these by him.